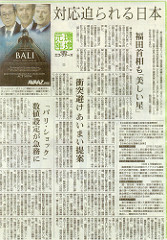 Japan Heeds Enviro Criticism. And Russia? Not So Much. Global climate talks tend to involve all sorts of peer pressure. Europe urges the United States to do more. The United States presses China to do more. Developing countries ask wealthy countries to do more. But does all this nagging ever work? Sometimes yes, sometimes not at all. Consider Japan and Russia. Earlier this month, the Japanese government divulged its plans to cut greenhouse-gas emissions 15 percent below 2005 levels by 2020, an announcement that was greeted with… near-universal derision. After all, those goals are even weaker than U.S. targets—even the much-criticized House climate bill would still cut emissions 28 percent below 2005 levels by 2020. Now, Japan got a slightly unfair rap, especially since, unlike the United States or Europe, it was planning to meet those targets without relying on (often shady) international offsets. Still, it's true that Japan's new goals were only a fingernail more ambitious than what the country had earlier pledged under the Kyoto Protocol, and they were nowhere near what scientists have deemed necessary to prevent catastrophic temperature rises (for wealthy countries, the IPCC has urged a 25 to 40 percent below 1990 levels). Turns out, all that criticism may have done the trick. As Noah Buhayar of The Wall Street Journal reports, Japan's environmental minister, Tetsuo Saito, recently said that the country was reconsidering its goals and may seek deeper cuts. On the downside, some of Japan's additional cuts through… international offsets. Still, it's a sign that all this gabbing at all these international forums, however slow and frustrating, might actually work to push countries to do more. Or at least those countries that mind what the world thinks of them. On the other side, there's Russia, the world's third-largest emitter, which recently announced plans to increase emissions 30 percent by 2020. Dmitri Medvedev argued that doing so would still put his country 10 to 15 percent below its 1990 emissions levels, thanks to the massive shrinkage of heavy industry that came with the collapse of the Soviet Union. That's not promising, though environmental groups just seem pleased that Russia's saying anything at all about the issue and engaging in talks, which was far from assured.